Starting conveniently close to Bangkok, the eastern region of Thailand offers local charm unaffected by mass tourism and a growing eco tourism scene along with some of the country’s most unspoilt beaches. I’m about to release a box of tiny parasitic wasps into the atmosphere and I’m not sure it’s really working up my appetite for a coconut snack. But after the cloud of critters disperses our guide explains that we’ve just unleashed an organic pest control into the plantation, bugs which will lay their eggs in the larvae of the black-headed caterpillar – the enemy of coconuts here in eastern Thailand. I’m touring the village of Ta Khian Tia on bike, pedalling past its coconut plantations, taking in peaceful lakes and stopping to meet the village’s oldest resident, Auntie Cheaun, whose sun-crinkled smile makes up for her diminutive stature. We stop for lunch at a local house, helping to pound the potent curry paste we’ll be eating with our chicken while we sip a bright purple drink made from butterfly pea. I’m only a few miles north of Pattaya but it couldn’t be further away in terms of the scenery or atmosphere. One of Thailand’s most built-up resorts, Pattaya has suffered from a less than salubrious reputation in the past because of its famed bar culture but is now a popular family destination thanks to its proximity to Bangkok’s international flights and a proliferation of child-friendly hotels and attractions. Pattaya is never going to be top of my Thai hotlist and no wonder, with no kids in tow I’m not its target audience. But its location, an easy two-hour transfer from Bangkok’s Suvarnabhumi Airport, makes fly and flop an easier prospect than with Phuket or Koh Samui. It’s also a jumping-off point for eastern Thailand, an undiscovered region which connects with Cambodia for those looking to explore further. Next to Pattaya, the Bang Saray region has cultural activities like the impressive Buddha Mountain, its limestone face embossed with a 109-metre-high image of the Buddha and filled with mostly Thai tourists paying their respects. Close-by, I stayed at U Pattaya, a trendy boutique hotel with an infinity pool looking out over a deserted yellow beach and giving off a barefoot luxury vibe with a beachy driftwood style. In Rayong province further east we drove through colourful fishing ports and saw fledgling eco tourism projects amongst mangroves. Then there are the islands - locals’ favourite Koh Samet and the mountainous Elephant Island of Koh Chang - both offering beaches to rival any of the south’s. 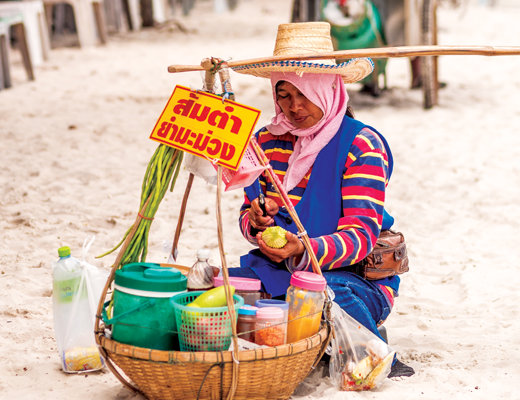 Fishing Village tour: Na Klua is the last bastion of Pattaya’s traditional fishing village culture. The Chinese community has clung onto its old wooden shop fronts with dusty unbranded goods piled up behind – making a marked contrast to Thailand’s omnipresent neon 7/11 stores! Take a tour with Thailand Ecotourism and Adventure Travel Association or TEATA to visit the fish market and help fisherman craft an artificial habitat to tempt back depleted sealife. Pristine beaches: Book in a few days’ beach time in Koh Samet to sample the white sands and relaxed vibes. Samed Resorts owns seven properties on the island but five-star Paradee is its most luxurious. Feast on fruit: Rayong is the fruit basket of Thailand and orchards offer a tour and buffet experience so travellers can see how they harvest native fruits like rambutan and mangosteen and sample the famously smelly durian. Snorkelling heaven: There are 46 islands in the Koh Chang archipelago and boat tours take snorkellers to several less-developed ones for picnics and exploring. Accommodation: Santhiya Koh Chang Resort is on-track to be fully refurbished by December and will add a new Pool Suite Water View room type (with a private swimming pool). Elsewhere, DusitD2 Ao Nang is scheduled to open December 15, 25 kilometres from Krabi International Airport, tucked away amidst lush green jungle on a hillside in downtown Ao Nang but walking distance to the beach. Across the water in Phuket, Pamooko Pamooka will be the eighth property from Kata Group Resorts. Located at Kata Beach, the family-friendly resort will have its own water park and 512 rooms and suites. Attractions: : Blue Tree Phuket Water Park will open some time next year and is billing itself as the island’s first international-standard, integrated water park and family entertainment centre. Set around the signature Blue Tree Lagoon, the park will feature several retail and dining outlets, a waterpark, beach club, and health and fitness facilities. “The Eastern Coast is very underrated. Koh Samet has to be one of the most beautiful islands in Thailand, with stunning beaches, jungle terrain and a very laid back feel but with upmarket luxury resorts. Although very accessible from Bangkok, it’s one of those hidden gems that hasn’t yet received mass tourism. “Further on there is Koh Chang which is the third biggest island in Thailand. It offers more lush jungle, but also nearby tiny little islands with isolated beaches lapped by blue water that you can visit on day trips. Hayes & Jarvis offer a 15-day Pattaya and Koh Samet multi-centre tour from £1,789pp based on a July 20 departure from Heathrow flying with Thai Airways, staying for seven nights room-only at the Intercontinental Pattaya and seven nights B&B in Paradee, Koh Samet - plus transfers.